A very low noise one channel amplifier enabling high bandwidth acquisitions for voltage-clamp measurements. The miniaturized ePatch amplifier integrates in a small headstage the low-noise amplifier, the pulse generator and the digitizer into only 42 x 18 x 78 mm and it is connected directly to the USB port of a laptop without the need of any other external bulky digitizer and control unit. Measuring the reversal potential of HCN2 channel. HCN2 channel currents activated by hyperpolarizing prepulse to −120 mV, followed by a test pulse to potentials between −110 and −60 mV (top panel). Data were saved in .dat format and analyzed off-line using Mathlab software (The MathWorks, USA). Plotting the current at the beginning of the test pulse against the test pulse potential provides the instantaneous current–voltage relation. Fitting data with a linear regression yields the reversal potential of -21,88 mV (bottom panel), in agreement with the the experimental conditions (25 C°; [K+]in 130mM; [K+]out 30mM; [Na+]in 10mM; [Na+]out 110mM) and the published PNa/PK (Biel et al. 2009). Biel, Martin, Christian Wahl-Schott, Stylianos Michalakis, and Xiangang Zong. 2009. “Hyperpolarization-Activated Cation Channels: From Genes to Function.” Physiological Reviews 89(3): 847–85. 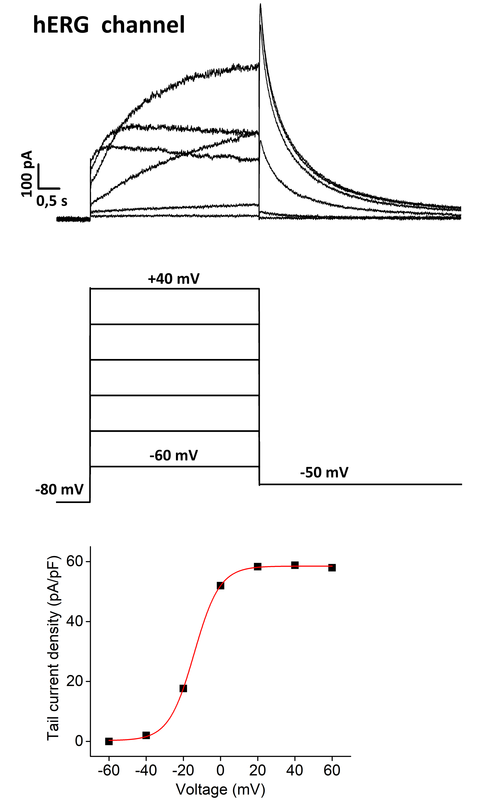 Voltage dependence of activation of hERG channel. Outward K+ current elicited by hERG channel transiently expressed in mammalian HEK293T cells (top panel). Cells were held at -80 mV and depolarized to voltages between -60 and +40 mV for 4 s, and then clamped to –50 mV for 6 s (centre panel). Data were saved in .abf format (Axon binary format v2.0) and analyzed off-line. 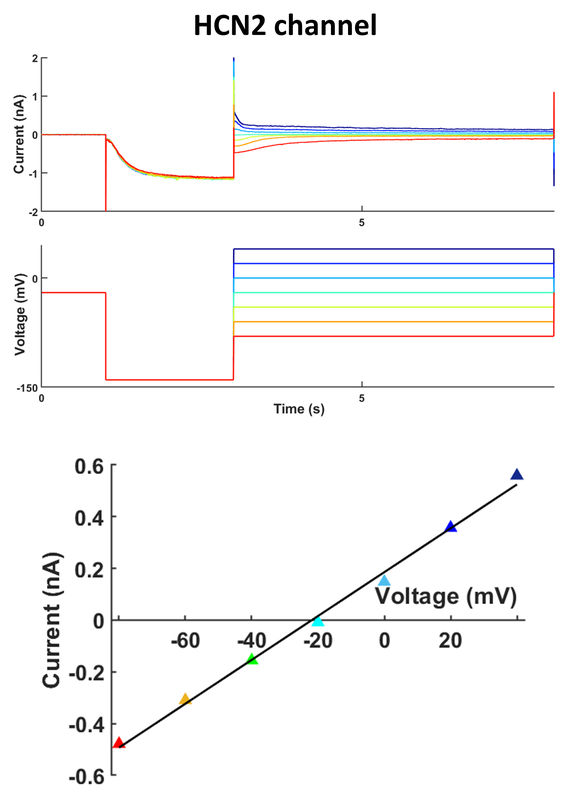 Voltage-dependence of activation was obtained from plots of tail currents against voltage; fitting to the data with Boltzmann equation provides the half activation potential of -16,2 mV (bottom panel) , in agreement with the value reported in Butler et al. 2018. Butler, Andrew et al. 2018. “Action Potential Clamp Characterization of the S631A HERG Mutation Associated with Short QT Syndrome.” Physiological reports 6(17): e13845–e13845. 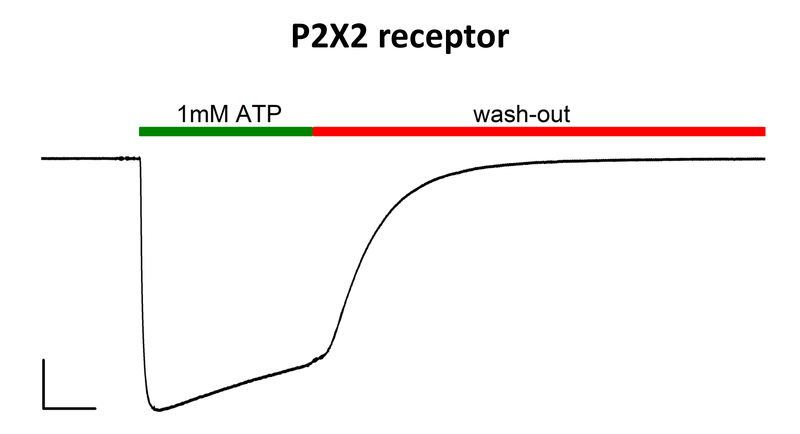 ATP-evoked inward current of P2X2 receptor transiently expressed in mammalian HEK293T cells. 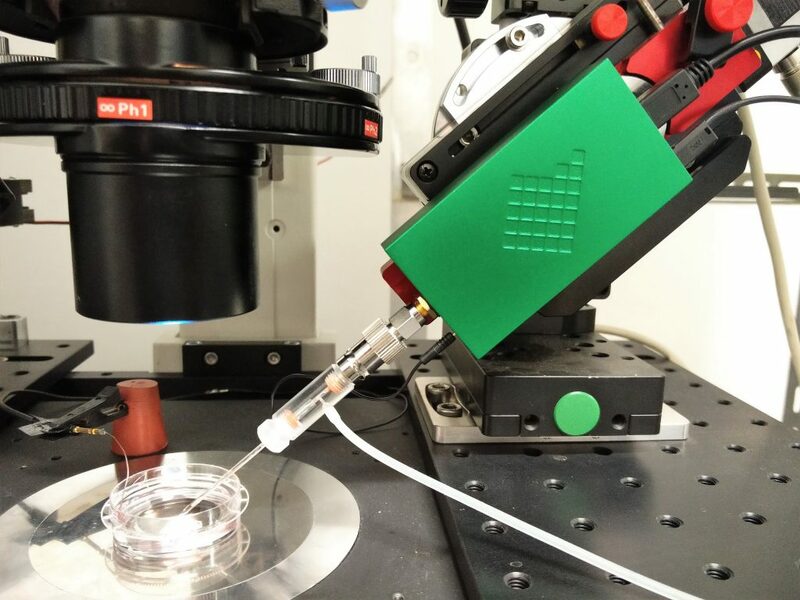 The cell was held at -40mV under the whole-cell configuration. Scale bar 500 ms/1nA. ATP was delivered to the cell for ~ 1,5 s by means of an automated pinch valves prefusion system and then rapidly washed out (green and red bar respectively).The experiment was performed at RT; recording solutions were prepared as in Habermacher et al 2016 (eLife, 5:e11050). Investigating the effects of lamotrigine on HCN channels: a test case for a new miniaturized patch-clamp amplifier. Helices D and E of HCN4 channel tune the CAMP responsiveness.